We have had a busy two weeks, so sorry for the lack of updates. I try to keep facebook updated as much as possible. Last weekend, a fundraiser was put on for our family for travel, medical expenses and Emily's chemo by Steve from Wholesale Guitars and it was an amazing night. Emily originally didn't want to go and the only way we could get her out the door is to let her wear her night clothes. (she lives in them). Once we got there, she didn't want to leave, her best friend, Lilly, from school was there and they have such a bond and a true friendship that is so great to see at such a young age. Everyone had so much fun, Jessie and Brianna did and it was such a great night. Steve thank you for all of your hard work for the fundraiser, it was an amazing night. Thank you to Amy for getting the shirts made and tank you to all of the bands and especially to Hali Hicks and her husband Trey Cordle. Emily didn't want to leave until she saw them play! Thank you for everyone's hard work and a wonderful night and thank you to the friends and family and people that we didn't know who come to support Emily and our family! THANK YOU!!!! We are on the road traveling en route back to Virginia, so if I have spelling anything incorrectly, I apologize in advance. Probably won't be home until tomorrow sometime, but we are en route. Its a long drive, but even longer for the kids with long periods in the van. We left Sunday afternoon heading toward Michigan and arrived late Monday night. Emily had clinic Tuesday morning with counts and injection. All of her counts remain ok, with platelets at 29. They wanted her to have her counts checked again on Wednesday before scans just to see if she was maintaining her own platelets. Anxiety for this scan has been pretty intense, mainly just because we changed up the treatment from the DFMO to the chemo on our own from research. 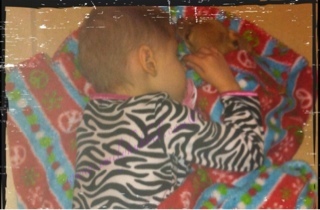 Emily's counts still remained ok, but her platelets dropped to 19, so she needed platelets. She ended up having a weird reaction to the platelets of coughing like crazy, but once they stopped them and the coughing subsided, they started them back up again, just slower. This definitely helped just took so much longer, so we had a long day in the clinic. Long days have been a normally lately, but the positive from that is that we aren't spending as much time in the hospital.and mainly only one day a week. Thank you to everyone who for the past two days and days before have shown their support by sporting the Emily gear and leaving their love and support on Emily's page. It means so much, and it helped. The last two rounds of chemo and Avastin have helped along with the homeopathic things that we are doing at home and only organic. Dr Sholler recommended with the positive results of the scans, to do two more rounds of the same chemo and Avastin, except that instead of doing 21 day cycle for the round, make it 28 days. Both Dr. Gowda and Dr. Sholler are both agreeing with this because of her platelets and hopefully this will give them more time to recover. We too are ok with this and will start looking into some other homeopathic stuff to add into the mix here. After the 2 rounds we will go back for scans and see how things look. The 28 day cycle should also give some more free time in the mix as well, so we are definitely ok with proceeding. The hope is still for CR (Complete Remission) and putting her back on the DFMO to either keep her in Complete Remission or at least stable (partial remission). Thank you for continued love and support and sending all of your thoughts, because they means so much and we are so hopeful to still get Emily into remission and this nasty disease gone and out of her. 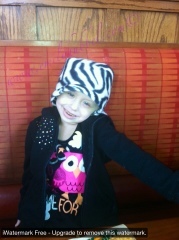 She is ready for treatment to be done, but she is handling this so well and we are so proud of her. Alright the kids are calling in the backseat, so that is my que. Remember to hug and kiss your kids and tell them you love them everyday!